A monster Joey Carbery penalty with 7 minutes remaining was enough to see Munster emerge from Pool 2 of the Champions Cup courtesy of a 9-7 win over Exeter in an absorbing 80 minutes that might have lacked quality and finesse but certainly not intensity. 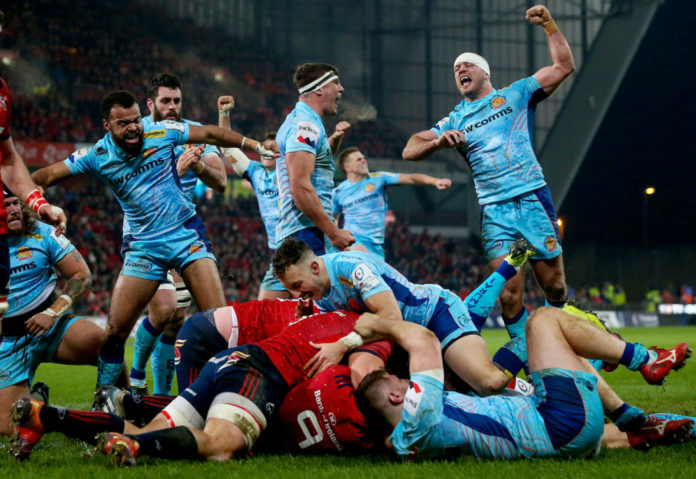 Munster opened with a sustained spell of pressure as two with Exeter coughing up successive penalties from a box kick and then from a lineout maul. The second infringement coming just inside the 22 which Carbery slotted to make it 3-0 to the hosts after 6 minutes. It was a decent opening for a solid opening for the home side but a needless penalty conceded by Niall Scannell at the ruck gave Exeter a chance to pin Munster deep in their own 22. Simmonds launched a perfect kick to within 5 metres. The lineout maul was set and with a penalty advantage for hands on the floor, Exeter’s went through two phases before Skinner crashed over from close range. Simmonds landed the extras to put the visitors into a 7-3 lead. The opening 1/4 would have taught Munster that possession was key and if they were going to kick it away, the chasers would have to be on their game. A scrum free kick saw the visitors opt for another scrum. Munster turned the screw forced a penalty which Carbery slotted to reduce the gap to one point after 22 minutes. Munster were their own worst enemies for parts of the opening half with some silly penalties and poor unforced errors. The second 1/4 of the game was an intense but largely forgettable affair in terms of quality. The home side’s decision making left a lot to be desired when with the clock in the red Munster failed to put the ball dead and coughed up a penalty which Exeter kicked to the corner. 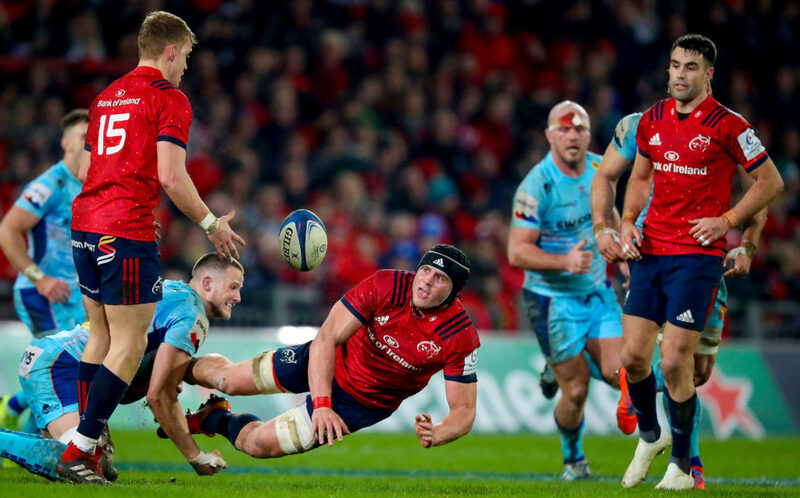 It resulted in another spell of needless pressure but Munster forced an error, turned over the ball and CJ Stander ran the ball off the field to end the half. Munster trailed by 7-6 and considering that Exeter outperformed them 64% to 36% in terms of possession and 68% to 32% in terms of territory, Johann van Graan’s side could count themselves lucky. The opening 15 minutes of the second half were not much better in terms of quality with Munster fluffing two good attacking platforms, one via a Conor Murray offload that didn’t go to hand and the second from an Andrew Conway knock on. Both were indicative of a Munster side who were trying just that little bit too hard to force the issue. The evening’s rugby was tough on the eye and even tougher on the heart rate. Two more opportunities were spurned deep inside the 22 from unforced errors. A lineout infringement from Peter O’Mahony gave Exeter a 5 metre lineout attacking launchpad. It spelled serious danger for Munster considering the potency of that Exeter maul. The newly introduced Billy Holland had other ideas and a towering leap saw him steal the throw. Exeter infringed and Munster would clear their lines. 69 minutes in a Jeany Kleyn turnover was greeted with euphoria from the home crowd as Exeter looked to get the try to knock Munster out. The ball was dispatched to touch and from the resulting lineout Exeter conceded a penalty. A full fifty metres out on the left hand side, Carbery called for the tee. Up he stepped to slot a monster kick under the most incredible pressure. Exeter frantically set about pulling a try back to give themselves a chance at an unlikely victory but Munster held firm to seal the win and make it to the 1/4 finals. 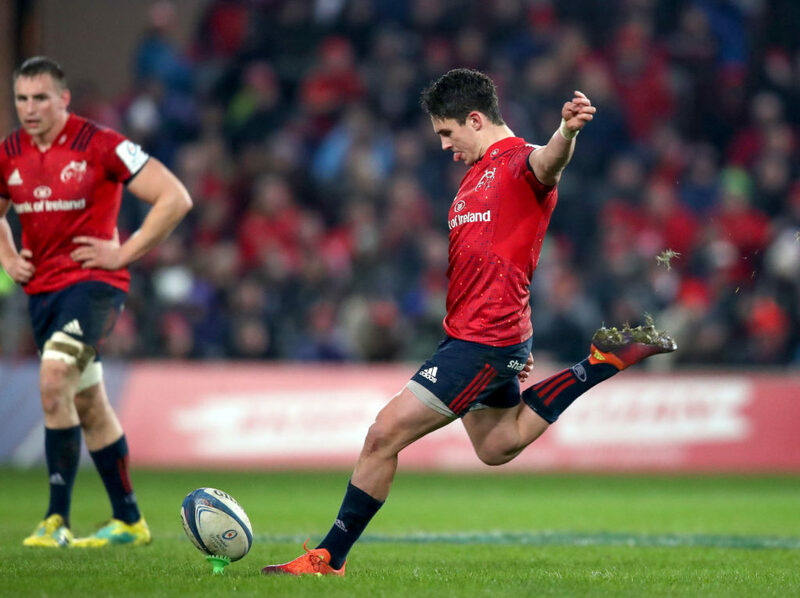 The post Late Carbery penalty sees Munster pip Exeter to progress from Pool 2 appeared first on Sporting Limerick.